Join us for our 3rd Annual Muttsquerade Ball! The Ball will be a special evening of Music and Merriment to celebrate Mardi Gras and raise funds for The Devoted Barn. There will be dancing, raffles, a silent auction, and plenty more fun! Each ticket includes dinner and 2 drink tickets. Thank you for helping support our Christmas Auction! Thank you for helping support our Fall Auction! We are so excited to have the Roseclair Eagles club throwing a Barn Bash Benefit in our honor! We look forward to seeing you all there! Ticket Purchasing: Tickets can be purchased from the club online by sending your payment via PayPal to fortheanimals6227@gmail.com or by check. To pay by check please email them at fortheanimals6227@gmail.com to receive the address the checks should be mailed to. If you have any questions about this event please reach out to the Roseclair Eagles club at fortheanimals6227@gmail.com or by calling them at (586) 381-0166. The Devoted Barn is honored to be invited back to another Vintage Market event! Come out see us, our animals, and all of the amazing goods throughout the market. Hosted by Hyatt Place Ann Arbor and Wolverine State Brewing Co.
Special Guest: Univeristy of Michigan Softball Head Coach Carol Hutchins will be in attendance! Come on out and meet some of our available dogs. Hopefully you'll find the newest member of your family! Puppy Shower - Operation Save Jenny's Sanity! As you all know our amazing volunteer Jen has opened up her basement and become our very own nursery. We are currently working on reconfiguring her basement into a more efficient nursery as puppy season approaches. We are hoping to have 3 separate nursery stations to accommodate any nursing moms or puppies that we come across this spring. Jen works so hard and takes such great care of all of our puppies that we would LOVE to really stock her up with puppy supplies and make her life as easy as possible. So we are setting up a special Amazon Wishlist and throwing Jen an online Puppy Shower… also known as Operation Save Jenny’s Sanity! We have included EVERYTHING Jen could ever possibly need to take care of our mamas and puppies. We really want to stock Jen up with mass quantities of potty pads, food, puppy toys and more so she doesn’t have to worry about running out of anything. Operation Save Jenny’s Sanity officially begins tonight, 2/27, at 7pm when we will be posting the new wishlist. The wishlist will only be active for 48 hours. Keep a close eye on our Facebook page and event page as we will be bringing you all sorts of fun updates, surprises, trivia and a silent auction! So invite all of your friends and share like crazy! Visit our Facebook event for more updates and fun! Come join us for our 1st Annual Muttsquerade Ball! Interested in making a bigger impact? Consider becoming a sponsor for the event! Very elegant 12 room hotel, walking distance to downtown Monroe restaurants, pubs and shops. 1 mile from I-75. Microwave and fridge in each unit. Complimentary coffee juice, snacks, etc. Discount rates available if you book by 1/31/17. 10 rooms blocked for The Devoted Barn. Standard rate without discount $129.99. Family pictures with Santa for your human children or your furry ones! Taken by The Devoted Barn's professional photographer Mike Walzak! You may include one of our willing Devoted Barn residents if you choose! In addition to Santa Photo's there will be Handmade Devoted Barn Crafts, Ornaments, Calendars, and Ava's Book available for purchase. Come take advantage of a unique and one of a kind photo shoot with our Santa at The Devoted Barn! Join us at Drinks Saloon Brownstown on December 1st from 6pm - 9pm for food, crafts, raffles and of course... a ton of fun! We will have some amazing raffle prizes as well as a 50/50 raffle. Come on out and have a drink with us! We'd love to see each and every one of you there! Looking for a new addition to the family or ever consider fostering a dog to teach them what living in a home is like? Join us at The Devoted Barn in Newport on November 20 to meet some of the dogs ready for that next step. We have everything from puppies to senior dogs, meat trade dogs from Thailand to feral dogs from the streets of Detroit, all waiting to be brought into a home. Bringing a dog into your own house not only gives that one a warm, loving place to stay, but also gives us more room in the barn to continue bringing in the worst cases and rehabilitating them to, eventually, be able to have a home of their own too. Please consider becoming a part of this amazing organization and come out to visit the barn on this fun day! We are exited to announce that the second Fearful & Feral Dog Rehabilitation Seminar is officially posted and will be in Shaggy's hometown, Grand Rapids, MI. In this full day seminar, we will discuss how our program works and share all of our secrets for capturing, assessing and rehabilitating feral, semi-feral and fearful dogs. At the end of this seminar, you will have a solid understanding of fearful dogs, differences and limitations of each group, body language, rehabilitation, and training processes for these dogs in your existing shelter, home or foster-based rescue. Including how we worked with Shaggy to get him where he is today! *Space is very limited* to ensure we can address all questions about material, programs and how to implement and begin a training program with your specific situation, population or dog(s). Seminar includes catered breakfast and lunch as well as training materials, resources, and handouts. There will be time post-seminar to sit down one-on-one so we can answer questions about individual cases. Come on out, treat yourself to some cider/donuts and meet some of our adoptable animals! We will have dogs of all shapes and sizes including a couple of adorable shepherd puppies and of course the infamous Nash. It will also be the adoption debut for a couple of our Soi Dogs! T-shirts and Ava's books will also be available to purchase. So stop by and say hi! We'd love to see you all! Join us for a fun afternoon of painting a picture of Sunshine! Tickets are $40 for a 12x16 canvas, all painting supplies and a two hour lesson by Betzi Lievens. It's BYOB, snacks are provided. Calling all LuLaRoe fans! Want to look at cute clothes, have fun, and raise money for The Devoted Barn? Then this is the event for you! Check out the Facebook Event for all of the details. Joel Rockey with One Last Treat and Zach Skow with Marley's Mutts teamed up to bring awareness to the number of veterans that take their own life every day. They committed to saving one shelter dog every day for 22 days with the help of veterans along the way. Joel is ending the 22 days here with us at The Devoted Barn. We are so honored to be able to help them by taking in one of these dogs. Joel will be driving our dog from California to us. Dogs can play a huge part in helping our veterans. We have seen that first hand here. We want to give Joel a big Devoted Barn welcome so we are throwing a big party, Devoted Barn style. We are excited to have teamed up with The Grindstone Smokehouse once again, they will be here with their delicious food. Please save the date and come welcome Joel, celebrate 4th of July and bring much needed awareness to this number and issue. Together, we can bring that number down. Good food, good friends and an issue that we need to talk about! Join us for Give Back Day with Gateway Chiropractic. They are offering adjustments or chair massages for a $20 suggested donation (or more, we wouldn't mind!) .... what a steal! A Keurig Coffee Machine with supplies! Gateway is very generously donating 100% of proceeds back to us , so come on out and Give Back with Gateway! Come join us at Drinks Saloon Brownstown for some holiday cheer! There will be raffles, 50/50, food specials and drink specials! We love to spend time with our supporters so come on out and have a drink with us! Includes Little Boo Hayride, Costume Contest, Karaoke, Trick or Treating, and Birthday Cake. As always all proceeds go directly to the care of the animals and maintenance of facilities. Join us for the Devoted Barn's Halloween Spooktacular and Chili Cook-Off. $30 per person gets you in the doors and includes dinner, two drink tickets, Haunted Hayride, and Photo Booth access. As always all proceeds go directly to the care of the animals and maintenance of facilities. 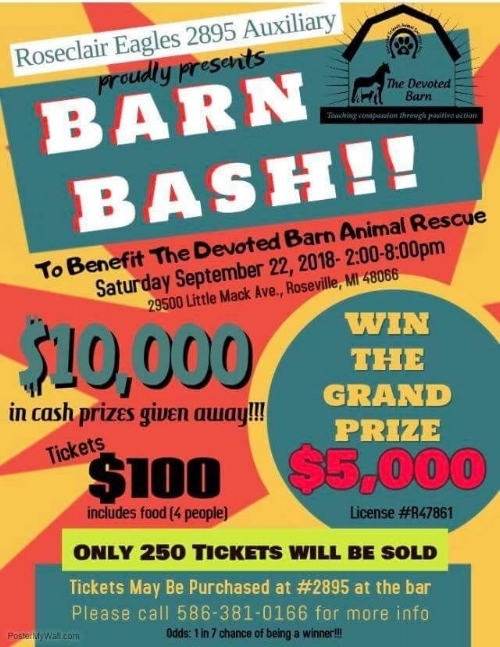 The Devoted Barn's Family Fun Day! It's time for our annual Family Fun Day! Saturday, June 20th, 11am - 3pm. Admission is $5 per person, kids under 3 are free. We will have a bounce house, carnival games, horse rides, face painting, merchandise vendors, food sold by Detroit Mini Donut and Shimmy Shack, and more! Please be sure to mention "Family Fun Day" in the comments box.